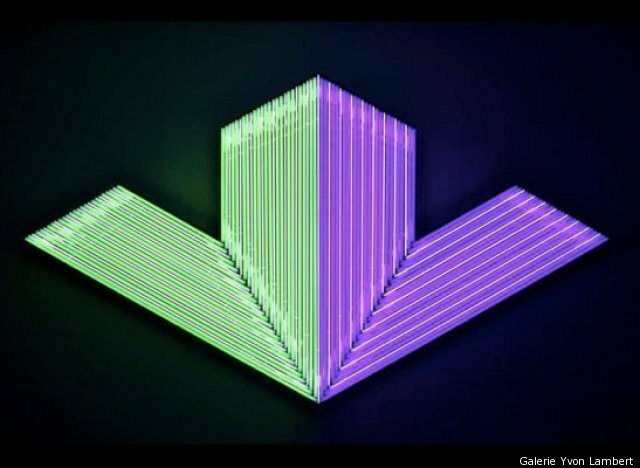 La Maison Rouge in Paris will present the first major international exhibition on the history of neon, titled, "Neon, Who's Afraid of Red Yellow and Blue?" A hundred years ago French physicist and chemist Georges Claude developed the first neon tube, displaying it for the first time at the Paris World Fair. When the element was first invented, scientist Morris Travers wrote: "The blaze of crimson light from the tube told its own story and was a sight to dwell upon and never forget." Now neon is mostly used to navigate others through urban areas once dusk settles in. Even though the material is nearly inseparable from the messages it carries, there was a long history that led neon to this point -- a history filled with experimentation and illumination. The exhibition features works from a variety of influential artists. Lucio Fontana's glimmering constellations invite the same contemplation as the night sky itself, while Bruce Nauman's "None Sing, Neon Sign" offers an electrifying play on language as a pattern of curves and lines rather than literal meaning. Explore the place where science, advertising and conceptual art meet. Artifice emits a life force of its own in this exhibition which hums and glows. "Neon, Who's Afraid of Red Yellow and Blue?" will be on view at La Maison Rouge in Paris until May 20. It will feature artists including Lucio Fontana, Francois Morellet, Bruce Nauman, Stephen Antonakos, Joseph Kosuth, Mario Merz, Jason Rhoades, Sylvie Fleury and Claude Leveque. whos afraid of red, yellow and blue?